Your human body was designed to operate out of rest, not stress! In this 2-DVD album, you'll learn the significance of biblical rest, and discover how you can rest in Christ despite your negative circumstances. Find out how God has gone before you and is working behind the scenes for your good even when nothing seems to be happening. As you get a fresh revelation of how God's abundant grace causes you to surmount every difficulty, you'll arise with renewed strength and a new attitude of thanksgiving and victory. Put an end to worry, fears and restlessness dominating your life today! About "Rest! 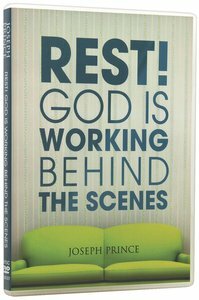 God is Working Behind the Scenes (2 Dvd)"